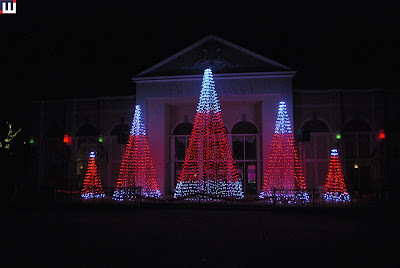 The park is divided into different Christmas themed sections. The first section you enter is Christmas Courtyard and features a large Christmas tree in the place of the icon fountain. 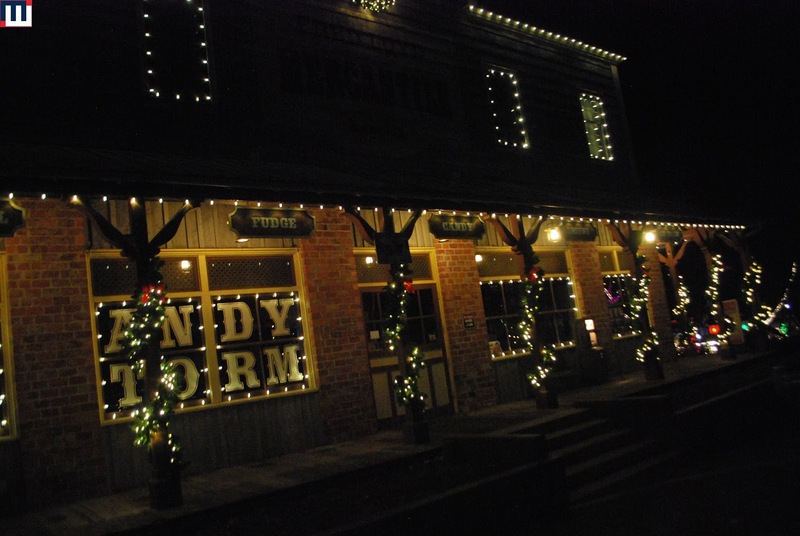 The front street shops are decorated in lights. The first of the large lighted trees is next to the funnel cake stand. The park has added several large ornaments around the park for this year. This one is located just past the train bridge in Tinsel Town. Holiday Harmonies have their own stage this year in Tinsel Town. A nice looking tree in front of Johnny Rockets. The Tinseltones are performing at the Empire Theatre. This trio of ladies perform a wide variety of Christmas classics. The show features tight harmonies by the ladies. It's a good show, but I noticed that there is not enough to keep the younger audience members entertained. Cut Tree Trail features over 100 decorated cut pine trees. It really helped to liven up the area near Spinsanity. Big Green is back. This is the largest lighted tree in the park and is located across from Mooseburger Lodge. The park had the lights on Fireball on, but the ride is closed for the season. Bugs Bunny National Park has become the Candy Cane Forest. This is probably one of my favorite decorated areas. I really like the look of the trees. Very neat. They did add some lights to the Carousel this year. S'moresville is the area back by Pandemonium. It was pretty dead this evening. Another large ornament over by Xcalibur. The area around the St. Louis train station is the North Pole. 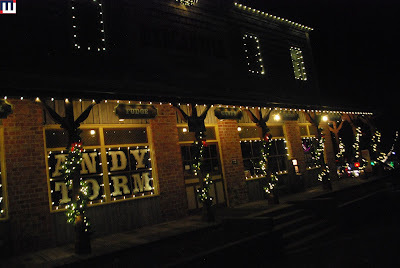 Candy Storm has some nice decorations. Miss Kitty's Saloon has been turned into Santa's House. Colossus is getting into the Christmas spirit with some red and green lighting. The vine tunnels have become Star of Wonder. Winter Wonderland is in DC Comics Plaza. This musical retelling of the first Christmas features a high-flying angel. They even have a live camel. It's a pretty impressive show. Christmas Courtyard has taken over the Palace Courtyard area. 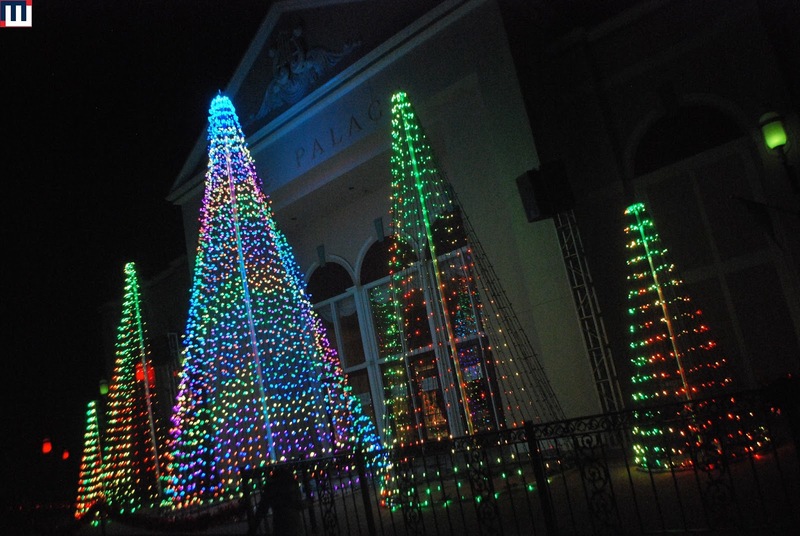 The Magic of Christmas Light Show takes place on the Palace Steps. 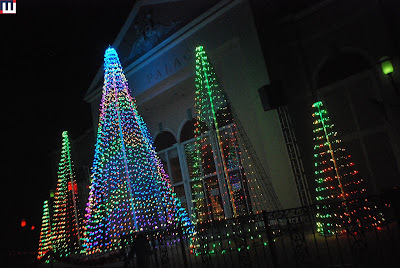 This light show features 5 trees created out of lights. It also features an original song created especially for Holiday in the Park. The show runs every 20 minutes starting at 5pm every night of the festival. It is definitely a great way to close out your evening. Holiday in the Park is open on select evenings now through Jan 1st.